We Profile Chicago's Hottest New Playwrights! This year Polarity presents four new plays in development written and directed by women. We will feature a profile of each of the playwrights over the next four weeks, beginning with Jenny Seidelman. Jenny's play, Outside/Inside, is a black comedy that explores race and cultural identity in the modern era. When Chinese American Ken meets the China-born, American-raised daughter of his white boss, his ideas about assimilation and who "owns" a culture are turned on their heads. Suddenly, he is certain that he and his white wife Lacy are the perfect couple to adopt a child from China. All he needs to do is convince Lacy, without offending his boss in the process. This interview was conducted by Dionysos Cup playwright Helen Valenta. The Dionysos Cup Festival of New Plays is co-sponsed by our friends at the Greenhouse Theater Center, 2257 N. Lincoln Ave, Chicago, July 10-20. Helen: How long have you been writing plays? Jenny: My first play was written and produced when I was about 16. I've realized that dialogue is my greatest strength and theater is one of my greatest loves. There's little that's more satisfying to me than to write, collaborate with other artists to bring the writing to life and then watch an audience experience that work for the first time. Jenny: Two things. One, in the first scene of the play, the protagonist's wife Lacy (who is white, the protagonist Ken is Chinese American) relays an incident in which she presumed that an African American woman was going to ask her for money. Lacy ignored the woman, who then called Lacy a racist. Stunned, and without thinking, Lacy called her a racist too. A similar incident happened to me and it really threw me. I needed to explore my own possible prejudices and perceptions when it comes to race. Two, I am married to an awesome guy who happens to be Chinese American -- born in the U.S. but with parents who immigrated here around the 1970's -- my observation is that it's been a tug and pull between the identities he carries with him. As he and I started thinking about having a family, the issues of cultural and racial identity came to the front of my mind. How do you integrate into a larger society while still maintaining ties to where you come from? Helen: How long have you been a Chicagoan, and along those lines, what do you think of the theatre scene here? Jenny: I am a lifelong resident of the Chicago area, born in the city, raised primarily in the suburbs and now back to being an urban dweller. I think we have an incredibly rich community here. It's amazing to me how interconnected everyone is and, generally speaking, how willing we all are to support one another. And the diversity in terms of theatrical genres and perspectives is pretty incredible too -- any kind of theater you could possibly want to see, from classics to new work to experimental is found here in this city. We're very lucky. Helen: What are some of your favorite playwrights and did they influence you in your own writing? Jenny: You probably wouldn't know it if you saw or read, Outside/Inside, but I love modern Irish playwrights like Martin McDonagh and Conor McPherson. They greatly influenced some of my recent plays about Irish travellers (one of which, The Traveller of Tenby, was a Dionysos semi-finalist last year). Their work has a beautiful sense of storytelling and a dark underbelly that I find appealing. I also love and respect Eugene O'Neill for his interest in experimenting with different types of theater, from naturalism to Greek tragedy to expressionism. I try to set new artistic challenges for myself with each new play that I write. For Outside/Inside, though, I've been looking to artists like David Henry Hwang, Branden Jacobs-Jenkins and Ayad Akhtar, who are asking questions that are similar to mine and are doing so with some humor. With Outside/Inside, I aspire to be thought-provoking in an entertaining way. Helen: Has being a playwright changed you at all? Do you view the world differently now that you're observing it so closely? Jenny: What's been most transformative has been the realization that the label of "playwright" was the right one for me. There's a great deal of self-confidence that comes with owning your identity and understanding your place in the world (theater and the world at large). It has not necessarily changed how I view the world, but rather how I view myself. I will be writinguntil the day I die. Helen: What have you gotten from this opportunity to be in the Dionysos Cup that you are grateful for? Jenny: The Dionysos Cup has allowed me to work closely with some very smart, thoughtful and talented new collaborators -- dramaturg Neal Ryan Shaw and director Helen Young, as well as the amazing actors who have participated in readings and development along the way. Writing is an isolating task and yet theater is a collaborative art form. It's necessary for the playwright to have other artists involved in the whole process of developing a new play. Simply having the opportunity itself, to create an ongoing dialogue about the work and how it's shaping up, then seeing it up on its feet, has been wonderful. Please join us for the festival. There's free parking in the lot a block north. 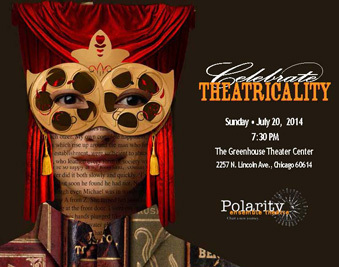 Polarity Ensemble Theatre invites you to CELEBRATE THEATRICALITY! Join us on July 20th, 7:30 p.m. at the Greenhouse Theater Center as we raise funds for our 2014-2015 season. Celebrate your own theatricality by arriving dressed as your favorite literary, theatre or film character. Best costume of the night wins tickets to our upcoming world premiere production of Miracles in the Fall! Mingle with our award-winning company over food and drink, all included. Bid on treasures at our silent auction. Enjoy live musical entertainment by classic rock band, Union Jack, featuring Polarity board member and ace set designer, Chuck Palia. Purchase your tickets early and save! Prior to July 14th, tickets are $45 each or 4 for $160 using the promotional code "four". Starting July 14th, all tickets are $50. Purchase tickets online at the Greenhouse Box Office or call 773-404-7336. Raise a glass and celebrate with us! Support a Season of All New Work! The Polarity Ensemble Theatre 2014-2015 Season is amazingly ambitious, including two world premiere plays by Chicago-area playwrights and two original novels! First up will be MIRACLES IN THE FALL by Chuck O'Connor, playing September 4 through October 5, 2014. Chuck's play operates like a work by Eugene O'Neill. The deep betrayals of the past twist the lives of the Connelly family, nearly destroying the next generation. MIRACLES IN THE FALL was developed in our 2013 DIONYSOS CUP FESTIVAL OF NEW PLAYS. It will be directed by Richard Shavzin, director of our award-winning 2013 production of Bill Jepsen's comedy, NEVER THE BRIDESMAID. It has been almost 30 years since award-winning author Fern Chertkow ended her own life, but her legacy lives on through the Afterlife Trilogy, a unique undertaking that fuses her writing with the work of novelist, playwright Richard Engling and the creative team at Polarity Ensemble Theatre. 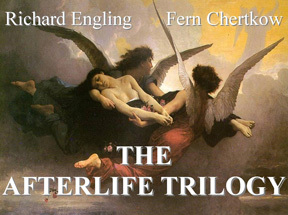 Paying tribute to the late author, the trilogy combines two novels: Visions of Anna by Engling and She Plays in Darkness by Chertkow (October 7, 2014, Polarity Ensemble Theatre Books) with a world premiere play written by Engling, Anna in the Afterlife, which will run April 23 to May 24, 2015. The three works span 35 years of creation, offering a multi-sensory experience when taken as a whole. In addition to a book release event, Polarity will present a number of readings throughout October and November at bookstores, libraries and book groups. We invite book groups to contact us to learn how to participate. Purchase tickets online for our benefit or call the Greenhouse box office at 773-404-7336.